Wooden sheds and log cabins often attract their buyers because of a few simple reasons: low price, simple assembly, quick construction and on the whole no permission is required to build them up. These versatile structures can be used as a compact gym, garden studio, guest accommodation, extra storage space or even as a residence. As mentioned, one of the big advantages is that the cabin will normally not require planning permission – or the procedure will be simplified. 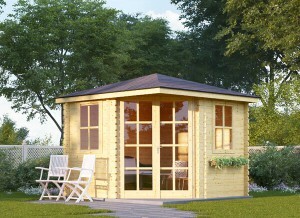 Most sheds are manufactured from pine or spruce. Pine is much firmer and regarded as the most appropriate, whereas spruce is not as solid – nevertheless, it is much lighter and preserves the natural colors for a longer period of time and can be easier to paint. 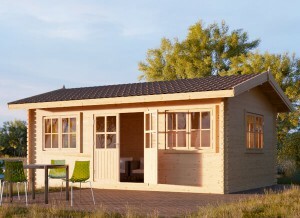 Twin-skin log cabins (manufactured interlocking two walls with a cavity) are usually used for all year-round permanent accommodation. 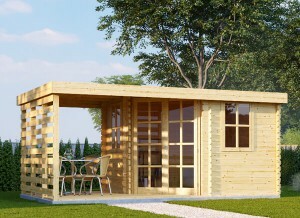 These cabins are extremely well insulated but it does take longer to assemble them. It takes just a couple of days to erect a standard log cabin. Some preparations are required in order to install the cabin and the most crucial part of this preparation is the base. 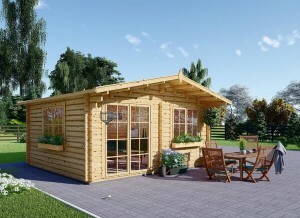 The most typical base for a wooden shed is a concrete base; popular alternatives are concrete slabs or a wooden frame. Importantly, you have to ensure that the base is as level as possible! Moreover, it should be raised from the ground. If the bearers of the cabin were to touch the ground (grass) rot and mold would appear quickly. The most common design of a wooden shed usually consists of double doors with windows on the front elevation. The roof usually has an apex running front to back, built up using tongue and groove boards, with very similar boards to the floor. The roof, however, requires some additional roof covering to protect wooden shed from rain, or even snow. Often a lightweight solution is preferred as the construction can take up to 65lbs per 10 square feet.